1830: Inventions of Railroad and Steam Power. Arts & Crafts movement is a reaction against industrialization. 1849: California Gold Rush prompts many to go west. 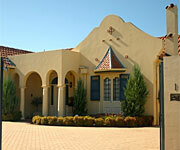 Spanish Colonial architecture influences the rise of Mission style architecture. 1865: End of Civil War and the beginning of Reconstruction mark the rise of Arts and Crafts Movement in earnest. 1877: William Morris founds the Society for the Protection of Ancient Buildings in the United Kingdom. His work influences the establishment of the National Trust. 1901: Gustav Stickley begins publication of "The Craftsman". The first issue is dedicated to William Morris and the second to John Ruskin, leaders of the Arts & Crafts movement in Europe. 1908: Sears Roebuck catalog introduces the mail order house: the average kit home has 30,000 pieces. Between 1908 and 1940, 100,000 homes are sold. 1909: Construction of the Gamble House Pasadena, CA by the architects Greene & Greene serves as a model for later Craftsman homes. 1929 — 1939— The Great Depression: The comparatively affordable bungalow gains popularity over more elaborate styles. 1935: Frank Lloyd Wright builds Fallingwater; modern architecture with elements drawn from the Arts & Crafts Movement. 1941: Start of World War II marks the decline of Arts & Crafts movement. The Arts and Crafts Movement, with its call to return to the ideals of craftsmanship and the honest use of materials that characterized past eras, evolved as a reaction to the increasing industrialization of the Victorian era. Spanning the Victorian Age and extending into the World War II years, the architectural and decorative impulses of the Art and Crafts Movement were expressed in various forms around the world. The founder, and one of the main voices shaping this movement, was the Victorian Englishman, William Morris. A poet, writer, designer and socialist, Morris spent time studying at Oxford University, intending to become a clergyman. He soon discovered he was far more interested in the decorative arts. The American Arts and Crafts Movement is characterized by the Craftsman style in architecture. Craftsman houses were generally one and a half to two stories tall. They were environmentally sensitive structures that not only suited, but made good use of their surroundings – the materials that went into Craftsman houses were usually native. In both architecture and art, the American Arts and Crafts movement shows a nostalgia for the personal and private in design and use. Decoration and color are muted and made useful rather than eliminated. Quality and craftsmanship is emphasized, and each element is given weight as part of integrating the design into the complete environment. Craftsman Craftsman style architecture is the hall of the American Arts and Crafts Movement. The founder, and one of the main voices shaping this movement, was the Victorian Englishman, William Morris. Its greatest American proponent was Gustav Stickley, whose periodical "The Craftsman" gave the style its name. Craftsman houses were generally one and a half to two stories tall. They were environmentally sensitive structures that not only suit, but made exceptional use of their surroundings. 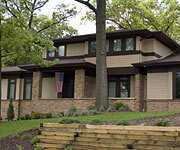 Most Craftsman homes are constructed from native materials. Bungalow The Bungalow offers a subtle variation on the Craftsman aesthetic – in fact, the two are so similar that many use the term Craftsman Bungalow to describe these homes. However, the Bungalow style derives from house forms created by English architects, who in turn had borrowed stylistic impulses from the Bengal region of India. Similar to Craftsman homes in materials and form, Bungalows often have broad overhanging eaves, large low porches with square columns, and hipped roofs. Low-pitched gables and exposed timbering reinforce the bungalow's horizontal emphasis. Colonial Revival Colonial Revival architecture favors simplicity over elaboration and is the first revival that was based on American architecture. Colonial Revival forms revived symmetrical floor planning and classical and colonial decorative motifs. Cape Cod architecture, with its trademark five shutter window facade, is one common example of this style. MissionAs populations in California and America's Southwest expanded, architecture throughout America was increasingly influenced by the remnants of Spanish colonial design. One resulting style was Mission, spanning not only architecture but furniture design and other decorative arts. Mission architecture showcases stucco walls with decorative parapets, red tile roofs, arched rooflines above square piers, and open, widely overhanging eaves. Tudor Revival The inclination away from standardization was nowhere better portrayed than in the ideals of the Tudor Revival. 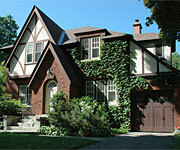 Exterior color schemes were typically of brown, white and black, sometimes combined with red brick. Incorporating exposed framing, thatch or shingle roofs, and rough-hewn stonework, Tudor Revival homes were intentionally made to appear older than they actually were. In fact, the apparently primitive construction details of such houses were often purely decorative. Prairie Another stylistic variation within the Arts and Crafts Movement is the Prairie style, popularized through the work of Frank Lloyd Wright. Often appearing to nestle into their surroundings, Prairie forms are horizontal in emphasis with low pitched roofs and large over-hanging eaves. Although firmly grounded in the Arts and Crafts tradition, their forward looking use of materials such as reinforced concrete and dramatic expanses of windows, have lead many to consider this the first Modern style. Arts & Crafts Hardware Arts & Crafts era hardware, even if machine made, features straight lines and functional forms. Decoration is simple and understated. Hand-hammered copper or iron, forged brass, and simple ball-tip hinges are typical of craftsman hardware. Dark colors and finishes, such as oiled bronze or antique brass, are particularly popular. The Arts & Crafts period features less innovation and more nostalgia than other eras, although there is a distinctive blending of craft and function in many Arts & Crafts style homes. Forged brass switch plates designed for modern electrical switches offer an example of how the old and new is often combined in an Arts & Crafts home.